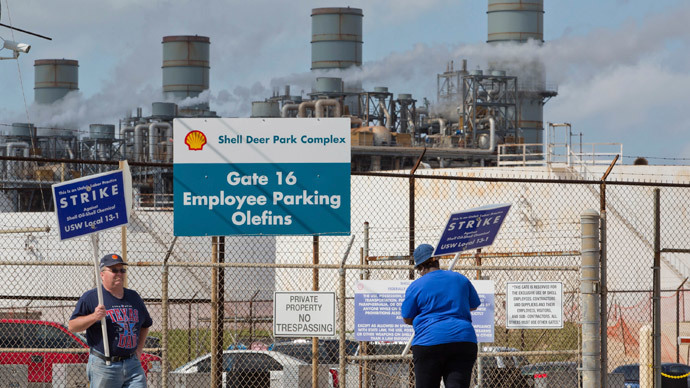 Workers at three refineries, one them the largest in the US, have joined a mass nationwide strike affecting some 20 percent of US refining capacity. 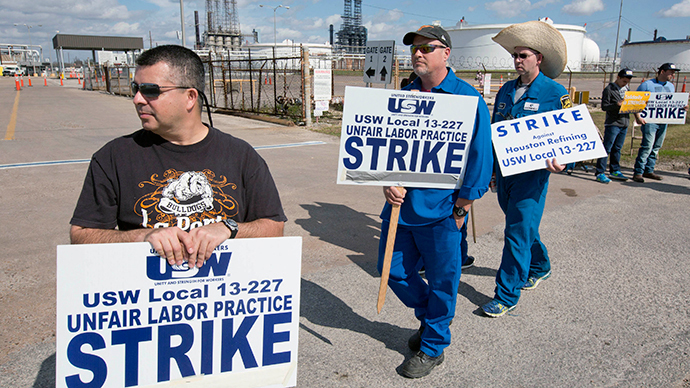 The USW union strike has hit its fourth week, after failing to reach an agreement with Royal Dutch Shell. The mass walkout of refinery workers – the first since 1980 – which started on February 1, has now expanded to four more plants. 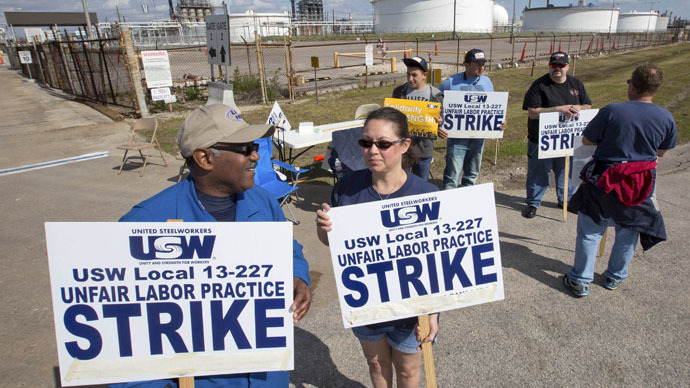 The union, which represents more than 30,000 American oil workers at more than 200 refineries, urged workers at the Motive refinery in Port Arthur, Texas to join the nationwide strike. “This refinery, a 50-50 joint venture between Shell Oil Company (American subsidiary of Royal Dutch Shell) and Saudi Refining, Inc. (subsidiary of Saudi Aramco), produces more than 600,000 barrels per day (BPD),” the union said in its call to action. 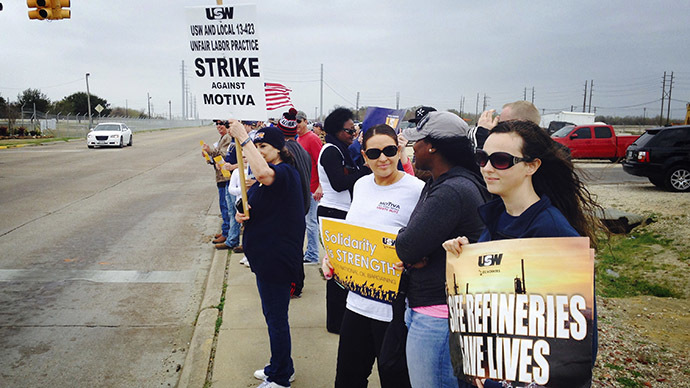 USW also issued notices for three other plants in Louisiana to go on strike. They include two of Motiva’s Louisiana refineries and a Shell chemical plant in Norco. “Capacity at these facilities is 235,000 and 238,000 (BPD). These refineries are also jointly operated by Royal Dutch Shell and Saudi Refining, Inc. of Saudi Arabia,” a press release reads. Twelve refineries and three other petrochemical facilities from California to Louisiana are now on strike, after the union rejected seven contract offers from Shell, the main negotiator which is also representing Exxon Mobil Corp. and Chevron Corp. With over 5,200 workers continuing to strike, the USW says it will continue to protest until an agreement is reached. "The industry's refusal to meaningfully address safety issues through good faith bargaining gave us no other option but to expand our work stoppage," United Steelworkers President Leo W. Gerard said. As USW represents a workforce that accounts for 64 percent of US fuel output, Shell could not hold in its disappointment. Ray Fisher, a spokesman from Shell, told Bloomberg that the Dutch company is “extremely disappointed” that the USW called for more strikes. It sets the “wrong tone” for both parties to move forward, he said.